Engaging children in service-oriented projects from a young age helps them realize that giving truly is receiving. Volunteering, especially with their peers, is a terrific way to have fun and learn at the same time. For students, volunteer opportunities are equally abundant and rewarding. Such opportunities can be organized by a parent-teacher organization (PTO or PTA), local community service groups, businesses, or the school itself. There are countless ways for students to make a difference, whether it’s tutoring other students, helping in a healthcare setting, or working with a construction team like Habitat for Humanity. 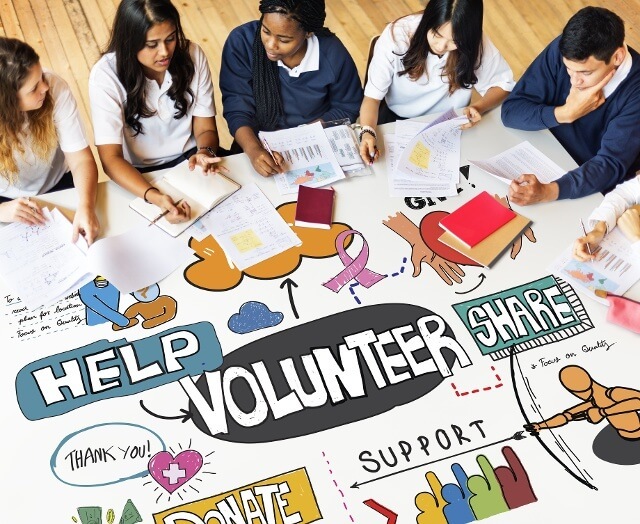 For older students, volunteer and service projects can be an important part of membership in a service organization, such as the National Honor Society. Service hours dedicated to a particular topic or project fulfill requirements for certain organizations and are great to include on college applications. Volunteer opportunities? They are everywhere! Volunteering for a cause is the best way to begin building a service-oriented attitude toward life. Every community has its own challenges and needs. Finding volunteer opportunities that work for your child, family, and school can take some time, but there are options all around. Support members of the military: Whether you’re volunteering for military families, veterans groups, or individuals on active-duty, it’s great to remember their dedication and sacrifice. Many groups volunteer by making care packages and Thank You cards. Others raise funds for memorials or veterans in need. Helping those in need: The core spirit of volunteering is to give a hand where needed. A good way to get started is to contact a local charitable organization, food bank, or homeless shelter and ask how your group might help. Food and clothing drives are important ways to help those who have less. By working with an organization that is already structured, you can find out what kind of projects would be of the most service. The elderly: We all know someone who is older and in volunteer opportunities students tableneed of a hand. Sometimes senior citizens can use help getting groceries, running errands, caring for their yard — or simply need someone to talk to. A special kind of volunteer commitment is the kind that lasts. Some older people do not have family members close by and would enjoy building a relationship with someone younger. Seasonal projects: In many communities, spring and autumn are a great time to give back — and take away! In the spring, debris in local parks, on trails, or on the school campus needs to be picked up. Reach out to the local Chamber of Commerce or Rotary to learn about volunteer opportunities in your community. During the summer, rounding up gently used clothes, bicycles, and other goods for a community yard sale is a great way to recycle items and raise money. Go outside: There are fantastic volunteer opportunities to help the environment! Citizen Science is a super way to gain skills and knowledge of how the natural world works. You could plant a rain garden, or help endangered butterflies by creating a Monarch Waystation. There are many diverse projects in which your child, school, or community can help the environment. As the saying goes, “Many hands make light work.” Volunteering gives students the chance to help themselves by helping others.